I’ve had a number of mails recently from people asking about safety in Colombia and I thought it would be useful to place things in context. 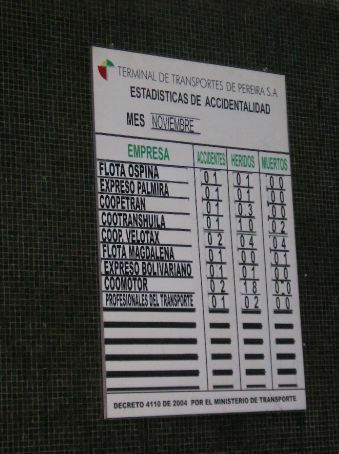 The picture above is a chart in a Colombian bus station, which are displayed in all the bus stations in the country. On it are the names of the bus companies operating from that station and the number of passengers who were killed or injured travelling with them in the previous month. Every company managed to mangle someone. Of course Colombia, despite its reputation, is a fairly efficiently run place, so it can insist on these statistics being collected and displayed. Who knows what the figures would be in other countries in South America, let alone Africa or South Asia, where only the most spectacular crashes (body count 10+) make the headlines. Travelling on the roads anywhere in the developing world is risky, especially at night. It’s probably the most dangerous thing you will ever do. The risk of being robbed or kidnapped on a bus does exist in Colombia, as it does in other countries of the world; but this risk is dwarfed by those you run - just riding it in the first place.